As we increasingly find ourselves feeling time poor, with not enough hours in the day to get everything done, virtual concierges are popping up to help with everything from gift shopping to finding a new outfit for a holiday party. These stylist-driven services will even select outfits to wear on a regular basis, eliminating trips to the mall or hours spent clicking through e-commerce sites. Clothing subscription services are popping up online, including Alberta's Frock Box– which includes Canadian designers in its deliveries – and New York's Dailylook. These companies periodically send subscribers a complete outfit based on their style profile, and anything users don't want to keep is returned free of charge, offering both a wardrobe surprise and freeing up time that would otherwise be spent shopping. Based in Toronto, Handled is a new online personal shopping site that offers purchasing, delivery, returns and alterations for clothing, accessories and gifts. A former executive in the tech industry, CEO Shira Yoskovitch founded Handled in June to address the gap between the retail and the concierge markets. "Handled is really a company that's born, frankly, out of my own experience and out of the experience of my friends of just going, 'I'm trying to take care of my job, I'm trying to take care of my life, I'm trying to take care of family and I don't have five minutes to get all this done,'" she says. Yoskovitch describes Handled as a way to outsource your personal life. "The busier I would get, the longer my to-do list would get and the less able I was to find people to not only help me, but get it done how I would." Handled promises to help with those to-do list items, like picking up turtlenecks for a child's skiing trip, and goes beyond to get to know the lifestyles and preferences of their clients. 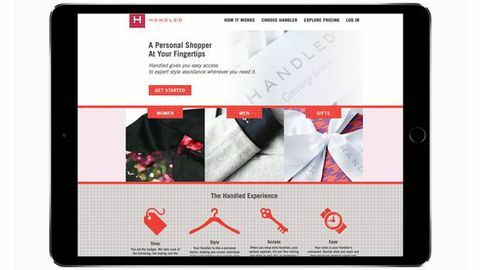 "Handlers" will complete wardrobe consultations, including purging, decluttering and evaluating what works and what doesn't, and styling services. "It's about giving folks access to things that maybe they didn't know that they could ask for," says Yoskovitch, adding that building a relationship is a key component of her business model. As for fees, Handled charges 20 per cent of the value of items purchased, a number that decreases with a higher frequency of orders. "This is about having a service that people can access to take pain out of their day." For 2018, Handled is expanding into travel concierge services as well as working on artificial intelligence and virtual reality capabilities for its website. For now, Yoskovitch and her team are gearing up for the madness of the holiday season. "We all have those days when you just need someone to help you and be in your corner," says Yoskovitch. "Then you can focus on the stuff that makes you happy." Illustrator and Globe Style contributor Alanna Cavanagh is showing her work at Toronto’s Jet Fuel Café. On until the end of November. Go Big or Go Home showcases her colourful illustrations of fashionable items. For more information, visit www.alannacavanagh.com. The Montreal Museum of Fine Arts has announced that it is producing the first ever exhibition on French designer Thierry Mugler. Opening in 2019, the retrospective will include more than 130 of his outfits, examining his work as a couturier, director, photographer and perfumer. For more information, visit www.mbam.qc.ca. Two new labels have launched this week. Toronto jeweller Myles Mindham has created an array of everyday wear jewellery pieces that will be available at Hazelton by Mindham Fine Jewellery, a pop-up boutique in Yorkville Village open until Dec. 24. And online shopping site Mr Porter has debuted its own in-house label, Mr P. Focusing on core styles, the line will also offer limited-edition capsule colletions each year.